Remove the right side cowling and side frame covers. Refer to “exterior parts removal and installation” in section 9d . Support the motorcycle with a jack to relieve load on the cushion levers. Remove the left muffler and muffler chamber heat guard no. 2. Refer to “muffler / muffler chamber / exhaust pipe removal and installation” in section 1k . Remove the rear shock absorber. Refer to “rear shock absorber removal and installation” . Remove the cushion levers (1). Install the cushion levers in the reverse order of removal. 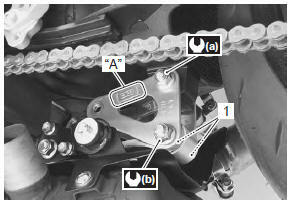 set the cushion levers so that the arrow mark “a” points forward. Install the washers (1) between the cushion rod and cushion levers. 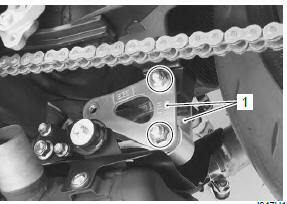 Tighten each nut to the specified torque. Install the rear shock absorber. Refer to “rear shock absorber removal and installation” . Install the muffler chamber heat guard no. 2 And left muffler. Refer to “muffler / muffler chamber / exhaust pipe removal and installation” in section 1k . Install the side frame covers and right side cowling.